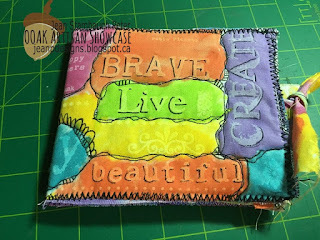 Today I am sharing with you my process of creating a fabric journal. For a while I had a creative block, but once I started it, it ended up only taking me about two hours to complete. I started by painting on some white on white fabric. 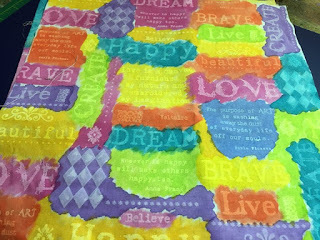 I love this fabric as it changes with dye or paint! I don't know how that fabric is made but it works great as a resist. I did two different techniques as you can see in my video. One, where I spritzed the fabric with water before painting; that created a watercolor look. 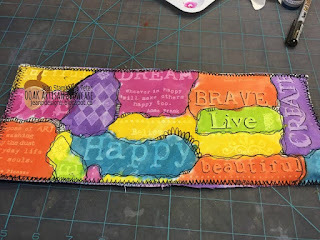 I tore the remaining painted fabric and started sewing. I added some pockets and strips and sewed them together using two colors of thread. I added a bit of batting between the painted fabric and the canvas backing to help make the cover a little stiffer. The pages were painted canvas just stacked and sewn in the center. The quilting is quite wild, following the painted lines with a little doodling in some of the spaces. For me, it’s so hard to do a project without doodling!! To finish it off, two more torn strips were sewn on the edges to give this journal a way to stay closed! or visit her blog, Eclectic Avenue.